Don't know if this horse has been beaten to death yet or not. If I do 3 then 2 the charger won't recognize the vehicle and will not charge. Am I alone or is this the gremlin in my car. Personally, I swipe the Chargepoint key fob rather than using the app. No problems that way, IIRC. I've never used the app, but with the card I simply tap the station, wait a couple of seconds for it to authenticate, after which it then tells me to plug the car in and automatically starts charging after I do that. Before unplugging, I tap the card on the station - otherwise I get an email telling me the car was unplugged. Followed my sequence and Evie charged just fine. I work for the city and the city runs the 2 chargepoint stations downtown and offers free charging to anyone. I worked and charged today it was a double bonus day. This is my method as well, connect charger, swipe fob, connect car. However, some EVSE stations (load balanced ones) are slow to activate 240 and the miev disables the charger, it never attempts again. If the EVSE takes over 3 seconds to activate AC it fails for me. That's quite annoying. I thought it was just my 2010 model not supporting the correct signalling, but it seems the more recent models have similar issues. databeestje, this thread is specifically about the ChargePoint brand EVSEs (ChargePoint being probably the most prolific supplier of public charging EVSEs here in the US). Is your comment about ChargePoint or some other brand of EVSE? I have a pretty definite issue with ChargePoint stations, including the newer two-headed units. The infamous charging 'timeout' happens very soon after plugging in and continues for 10-45 minutes. Now that my pack is degraded, the ability to harvest at least 3 kWh during an hour on L2 can make all the difference. Just last night, I needed an hour of opportunity charging and on a new ChargePoint station, I got maybe 5 minutes of 3 kW, then a 10 minute timeout and then 25 minutes of charging at only 1.1 kW before I had to leave. 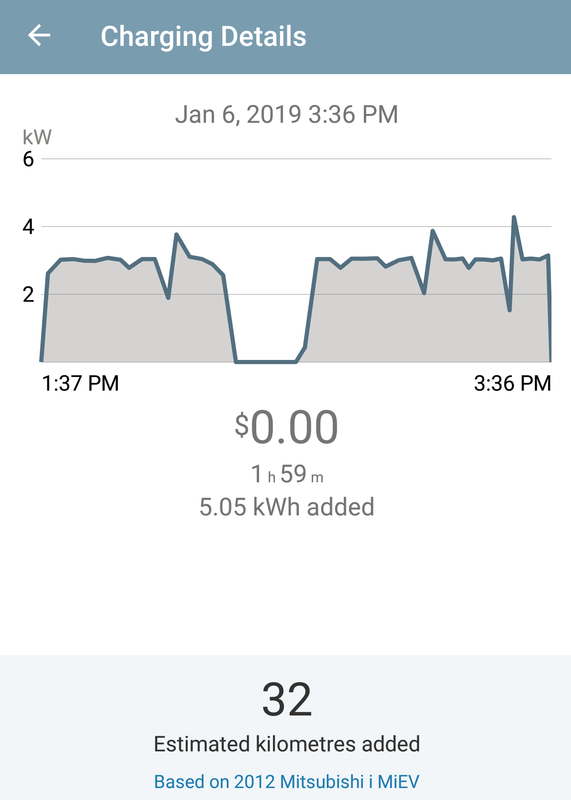 A grand total of 0.57 kWh added in 43 minutes! Can anyone else confirm this issue with ChargePoint? jray3 wrote: I have a pretty definite issue with ChargePoint stations, including the newer two-headed units. I use Chargepoint all the time and I haven't seen this at all. I do see the car will periodically stop charging for 20 minutes or so but I see this at home and I saw this on a Flo charger a few days ago. But when it resumed it goes back up to 3kW or so and I see 208V/14A. I only see the charge speed decrease when it's around 90-95%. Here's how that session looked like. I only see it stop when I'm charging from low SoC. I was at 15% when I stated and a Bolt was using the DC charger. jray3 wrote: The infamous charging 'timeout' happens very soon after plugging in and continues for 10-45 minutes. ... Can anyone else confirm this issue with ChargePoint? AFAIK, this is down to the car. I don't know why it does it. But it's not specific to ChargePoint. I see the same thing at home with my JuiceBox. I think it always does this, unless you get lucky with a partial charge. The timing seems random.